Situated on 12 acres along the banks of Lake Kittamaqundi, Sheraton Columbia Town Center Hotel provides a restful retreat for business and leisure travelers. You'll love our convenient location halfway between Baltimore, Maryland and Washington D.C. and close to Annapolis. Walk to major attractions such as Merriweather Post Pavilion, Columbia Mall and the downtown lakefront. Sophisticated rooms and suites offer complimentary Wi-Fi, mini-fridges, microwaves and the Sheraton Signature Sleep Experience. 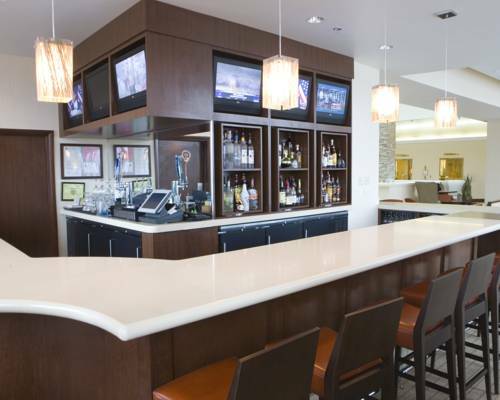 Our upgraded accommodations provide access to the sleek Sheraton Club Lounge with Lake views. Elsewhere at the hotel, you can visit the 24-hour fitness center or swim in the seasonal outdoor pool. Waterside Restaurant and Waterside Lounge offer artfully prepared American dishes, complemented by creative cocktails and lake views. Those planning events in Columbia will appreciate our 14,000 square feet of flexible space and exceptional catering services. During your down time, you can visit the spa, golf or fish. Waterside Restaurant: Breathtaking views of Lake Kittamqundi make every meal an event at Waterside Restaurant. Open daily for breakfast and lunch, it is a Columbia landmark for locals and a special treat for out-of-town guests. Waterside Lounge: Open for dinner, this relaxed restaurant and bar offers craft cocktails and flavorful fare. Join friends or colleagues and unwind after a busy day in Columbia.